The Monitor system we provide is mounted in a weatherproof cabinet and is normally mounted in the tank security cabinet. 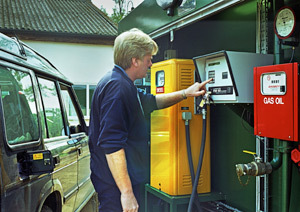 Fuel is drawn by insertion of a uniquely coded key and entry via the keypad of a PIN and odometer (speedo reading). Each transaction (drawing of the fuel) is stored in memory for downloading to a PC running the compatible software program. The Data collected can then be analysed and provide detailed information of fuel usage by individual vehicle, vehicle type and department.